We were driving home one night when we saw cars ahead of us swerving left and right. We thought there was an accident, but it was a dog standing in the road, looking very lost and confused. All the other cars were driving around him, but we pulled over to the side of the road. I got out and called "sweetie, sweetie" in baby-talk. He lumbered over and immediately climbed into our back seat and collapsed. We took him home. The dog had many health problems. His tongue was so swollen that he was unable to eat or drink the first night. He had a growth hanging on his leg. We took him for emergency evaluation the first day, then to a regular vet. He had anemia and wasn't well, so we couldn't turn him in at the shelter. Usually I turn strays in at the shelter so that their owner can find them, but if you turn in an ill dog, they don't receive medical care. This dog would have simply failed. So we kept him and started on the road with veterinary care to get him well. His tongue got better, the growth on his leg was removed, he got fed lots of good stuff, and various medicines were prescribed to work on his anemia. We wound up calling him Buddy Bear because he was such a teddy bear... he loved to cuddle! he became part of the family. Buddy and Indie became best friends. They did a lot of exploring together. Whenever Buddy was feeling better, they would spend hours in the yard sniffing around. Prissy miss Alex enjoyed having a man around the house, though Buddy actually didn't like her very much. Buddy loved people and whatever we did, he wanted to do. ...and more than anything, he loved being petted & baby-talked to. "Mom, the light has turned green. Quit taking my photo and pay attention!" 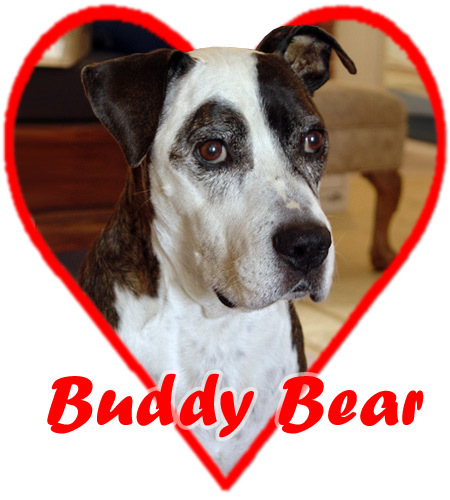 As far as we could figure, Buddy Bear was a mix of American Staffordshire Terrier, and short-hair Saint Bernard. His Saint Bernard side showed in his size, his huge eyes, the shape of his head, and his hysterical reaction to thunderstorms and fireworks. His American Staffordshire side showed in the colors of his fur, his oversized head, and the pink skin-spot on his nose. When we first had Buddy he was quite sick. He got better, though, and for some months he was doing very well. Then he got sick again. Buddy had a lot of visits to the veterinarian. He didn't like going to the vet, but he was always a perfect gentleman about it, in his own goofy way. Buddy Bear died of liver failure on September 26, 2006.
and we'll always miss him.